Laurel & Hardy were a sensation beginning in the ‘20’s, faded a bit in the ‘40’s, and then had a comeback in the ‘50’s. Their act was an old-time slapstick comedy, with each being a buffoon or a straight man in turn. 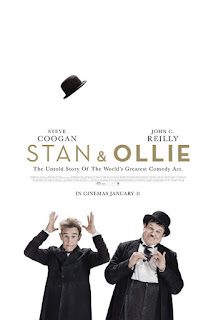 But Stan & Ollie is less about their act and more about the relationship between them during their long association, which survived when their other relationships did not, necessarily. In the film, we see them working, amiable and jostling together as they dream up their act. Stan Laurel was the writer, and his work got them started on planning an act. As time goes on and, as in all relationships, previously overlooked feelings start surfacing. It gets more complicated as their wives join them on their last tour through Europe, ending in London. Hardy’s wife is the traditional American wife, nurturing and ever mindful of her husband’s welfare. Laurel’s wife is more cosmopolitan and has had something of a career as a dancer. Her acerbic personality provides more entertainment in its contrast with the American conception of the “ideal” wife. The casting by Andy Pryor is right on. John C. Reilly, in his usual “nailed it” mode, shows Ollie as someone who looks like he doesn’t know much and is a buffoon underneath, but actually shows a kind of intelligence that complements the Laurel character’s creativity. Steve Coogan likewise shows both sides of the buffoon-smart character. Each deals with the business of entertainment in very different ways, and each is successful in his own way, although they don’t necessarily fit together in a negotiation. Best to leave them negotiating on their own. I especially enjoyed the wives. Shirley Henderson is a staple in British theatre and television, reliable in projecting color and meaning into a story. Nina Arianda similarly gives movies she’s in a special punch. The writer (Jeff Pope) and director (Jon S. Baird) wisely use the two wives to illuminate the personas of Stan Laurel and Oliver Hardy. The kind of comedy Laurel & Hardy embody is not especially appealing to me, but I found this account of their association compelling and moving. Laurel and Hardy as Stan and Ollie in their private lives.